Selling too much? It sounds like a joke. There is never “too much”. Any reservation is welcome, and the more the merrier. I’d like to talk about an issue I have heard mentioned by several hotel managers, they’re worried about their excessive dependence on the high percentage of reservations that they get through Booking.com, while their official hotel website is unable to produce the same good results. Booking.com has grown spectacularly in the past few years. They have carried out an excellent work, they have a fantastic website in relation to customer experience; they have created a huge affiliate network and a ubiquitous presence on the internet that has given them an enviable position in Europe. 1. – Excessive dependence on just one provider. 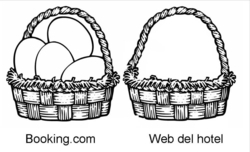 The hotel managers’ traditional wisdom says it all “Do not put all your eggs in one basket”. I would add: “…especially if that basket isn’t yours”. I think that the direct online sales channel is an exception to diversification: As the ideal long term target, it should try to get limitless growth, to the expense of the middleman. Booking.com isn’t cheap for the hotel, especially the contracts that provide more sales volume and more visibility. You could argue that there are other middlemen who are as costly or more than Booking.com, but there are also others that are better value for money, especially: direct online sales. 3. – Increasingly higher pressure on the hotel to make its conditions stricter. Booking.com has on its site 648 hotels in Barcelona and 526 in Madrid. That is to say, all of them, and they can be checked by any user. They don’t have a lot of space for growth, at least in the big Spanish cities. They could try to grow by making their conditions for hotels harder and harder to fulfil? Not being on Booking.com is a luxury that not many hotels can afford. Not just because of their sales capacity, but also, because of the visibility that the hotel gets by being presented to thousands of visitors: Many of these visitors choose the hotel in booking.com and end up booking on the hotel website. Basically, even though Booking.com advertises itself as “Hotel bookings online”, and that’s what they want to promote, advanced users see its alternative use as a directory and a hotel comparison site …one important reason for the hotel to be present. 5.-Not a lot of space for differentiation. The huge visibility for the hotel provided by Booking.com is balanced by the fact that it presents all hotels in the same light, and standardized images. The record for each hotel in Booking.com isn’t an ideal advertising platform for those who already have a differentiated product, who have been able to develop clear features that appeal guests, who have identified them, or who want to offer a style and an image of themselves that is clearly defined. The problem gets worse when Booking.com distributes the information among its many affiliates, and the image of the hotel can appear in difficult conditions and also difficult to trace. I believe that Booking.com has an opportunity here, if it’s able to find more ways of highlight the differences of those hotels and all their especial features. Besides, those hotel managers who are normally “enterprising” with regards to marketing usually tend to be as well in other situations, and that’s why they are more critical and feel uncomfortable with their relation to Booking.com and the inconveniences it represents. What can a hotel in this situation do? Is there any way to break with the vicious circle? How to get rid of the big and powerful arms of the Booking.com bear without having less reservations or an increase in costs? 1. The desire to act. It seems obvious, but maybe many hotels are happy with this situation, in which somebody like Booking.com provides them with a considerable number of bookings. They don’t see the disadvantages I presented above and they don’t have to develop the marketing actions themselves. It’s totally okay. If, on the other hand, the hotel has other needs, maybe it would be receptive to the idea of looking for other alternatives. 2. Investment in advertising. That is the key of everything, and the key that opens all the doors for a change… and I’m not talking about investing more. The second part of this post will explain the alternative solution and express it in mathematical terms and terms that are valid for the hotel. Aunque Booking.com no es nuestra mayor fuente de reservas, es un intermediario que no podemos desestimar, como bien dice César, no sólo por su capacidad de ventas sino sobre todo por la visibilidad que nos proporciona. Nuestro hotel trabajaba con paridad entre los intermediarios, pero sin paridad entre éstos y nuestro sitio web. Por este motivo, Booking.com decidió eliminarnos temporalmente de la venta hasta conseguir dicha paridad. Booking.com es de momento el único intermediario que nos ha puesto problemas con la paridad entre ellos y la web. Pienso que no podemos prescindir de los intermediarios, por lo menos de momento y en nuestro caso. Sin embargo, debemos potenciar nuestra venta directa online. El tema es importante, recuerdo que cuando se inicio la venta atraves de Internet, las comisiones rondaban por el 5%, Ahora este capitulo se ha incrementando a cotas muy dificiles de soportar. Los hoteleros huímos de los Mayoristas por su volumen de comisiones y descuentos, y nos adentramos con alegría a este medio nuevo, ¿que ha ocurrido?, sencillamente, que este pequeño medio en un pricipio, se ha convertido en un dragón que se lo come todo poco a poco, se comio a muchas Agencias, paso a Mayoristas y ahora pasa a Hoteleros, son insaciables a la hora de pedir, cada dia piden más y más. Y esta muy claro que hay que ir procurando evitar la dependencia de estos, porque al final sera desastroso, AL NO TENER RENTABILIDAD, EL HOTEL TIENE QUE MINIMIZAR LOS GASTOS, PERSONAL, CALIDAD, SERVICIOS, y tiene que ingeniarsela para poderle sacar algun adicional a todo el cliente que nos llega. Eso, al final es negativo, porque nos han extraido nuestra esencia y el valor que vamos a ofrecer cada vez será mas exiguo. No es que estamos rompiendo los huevos de una sola canasta, es que estamos matando la gallina. mayoristas de Internet (boooking y demas). ¿No ceder a las exigencias constantes de ellos, via descuentos, via, rapel, via mas pulbicidad? Solo nos queda hablarles claro y decirles miren, si ustedes nos dejan sin rentabilidad, tendremos que ofrecer de alguna manera encubierta una tarifa para los clientes que contraten directamente. ¿Cómo aplicarla?, pues dandoles dias gratis, dandoles regalos, ofreciendoles ofertas, no se se me ocurren muchas cosas…………………………. ¿ A USTEDES SE LES OCURRE ALGUNA QUE QUIERAN COMPARTIRME? ¿cabria un intercambio de habitaciones, yo vendo para ustedes y a cambio les dos habitaciones para vender ustedes o algo parecido?, seria tal vez un bvuen punto de partida. Sugieranos sus ideas. Los hoteles funcionan por ley con “tarifas minimas y ·máximas” que son comunicadas por escrito al organismo competente de Turismo de la CCAA a que pertenezca. Si la factura que te cobran está por encima de ese precio -como dices- está claro que es un error demostrable. Booking a pasado de ser un partner a ser un gasto. Dominan el mercado de las centrales de reservas, y se permiten hacer lo que quieren de forma unilateral. Su estrategia es tener todos los hoteles del lugar para que el cliente tenga la sensación de estar frente a una base de datos perfecta, completa y con una evaluación transparente de los establecimientos, es decir basado sobre la calidad real del hotel. Y es que a priori es lo que se percibe cuando utiliza Booking, no se nota realmente las manipulaciones realizadas, cuanto al ranking (tipo de comisiones distintas para cada hotel, …), para que el cliente elija realmente el hotel que más comisión dejará en las arcas de Booking. Fue increíble el aumento de las comisiones cuando incluyeron el IVA en la base de cálculo de las comisiones. Increíble pero todo el mundo lo acepto. Si fuese cualquier otro gasto, o peor los sueldos, nadie aceptaría un aumento del 7%. El problema a medio plazo puede ser, como dice Cesar, la ansia de crecimiento que muestra Booking, sabiendo que lo va tener cada vez más difícil, y que puede terminar exigiendo demasiado a los hostelero llegando a una ruptura. Todo los excesos se terminan pagando. Como ha dicho antes Emilio hay que potenciar las alternativas, booking es el que más vende con diferencia, pero hay herramientas para el hotelero que debe de aprovechar, entre ellas la más eficaz es exteriorizar los servicios web, digo esto por el hecho de que para que los hoteleros ahorren gastos y evitar asi a los informáticos en nómina. Que el mantenimiento de una web pasa por ese tema, el posicionamiento es más importante que nada. Hay empresas que elaboran web con dominios propios y con motores de reservas capacitados para absorves reservas en tiempo real. Dejar el mantenimiento de la página a terceros a cambio de una comisión por las reservas es la forma más económica y actual que se esta llevando a cabo por parte de los hoteleros dispuestos a fomentar su porpia web corporativa antes que ceder más porcentaje a las centrales online. Soy representante de una central online y puedo decir que buscamos la diferenciacion entre hoteles, fomentando incluso la propia web de nuestros clientes. Mirad esta web… hace promociones y potencia el uso de las reservas directas. Cosa que booking.com no puede llegar hacer. Nosotros administramos un portal de vacaciones (no para hoteles, sino para apartamentos) y cobramos por el alta, o bien un fijo anual de 9 euros más IVA, o sólo por formulario enviado. Llevamos en internet desde 2.003 y, a fecha de hoy, seguimos contando con provincias en las que no hay ni un solo alojamiento dado de alta. Ofrecimos en su momento a varias empresas anunciarse gratis y ni nos respondieron. Estamos decentemente posicionado en Google (los primeros por “alquiler playa”, para empezar) y encima somos nosotros, no los anunciantes, los que confeccionamos el anuncio. El pago que solicitamos por lead es, en la práctica, equivalente al que solicitan los grandes metabuscadores ¡¡por clic!! Reconozco que la postura de los propietarios de estos bloques de apartamentos ubicados en la playa no la acabo de comprender muy bien; al parecer, prefieren someterse a la dictadura impuesta por los grandes mayoristas que intentar dar a conocer directamente su negocio con nosotros y con otros pequeños portales que funcionamos bastante bien en temporada alta. Buenas tardes, me gustaria conocer su portal. Hola Luis, me gustaría saber cual es esa página. Se trata de un directorio 100% gratuito, correctamente posicionado, diseño claro y correcto, sin coste de alta, sin comisiones, sin letra pequeña, con enlace directo al sitio web del hotel. Vamos, un “rara avis” en los tiempos que corren. Los ingresos los obtienen de publicidad indirecta de google y al igual que los esfuerzos en SEO, Facebook, etc. parece una buena oportunidad para reducir costes fijos de promoción, y sobretodo dependencias excesivas de comisionistas. Alternativas y oportunidades, haberlas, haylas. Hay que conocerlas y darlas a conocer. Personalmente veo que Booking ha hecho un gran Negocio. Actualmente es importante estar presente en Booking porque sino pierdes visibilidad y notoriedad. El comportamiento del usuario lo conocemos todos, mira en booking mira en la web del hotel y si le convence el hotel y el precio es más interesante, compra en la web del hotel, por tanto creo que Booking lo hace bien, aunque nos genere una comisión a los hoteleros. todos queremos que nos compren a través de nuestros canales directos y no a través de intermediarios (tener más beneficios y menos comisiones), pero actualmente sabéis que hay TTOO y AAVV que están restándose de su comisión para entrar al cliente final vendiendo por debajo de la BAR (Eso es lo que tenemos que evitar) controlar a esos que nos están rompiendo el mercado y que se están pasando por el ……. las condiciones contractuales pactadas. ¿Cómo puede ser que si tengo de BAR 85 € haya un site que lo ofrezca a 61€?. Sinceramente los intermediarios como tal están condenados a morir, hay que ofrecer un servicio de valor añadido para justificar ese coste. How do hoteliers feel about selling through airline web sites? Our airline customers say that hotels prefer them (the airlines) as a distribution channel, but I would like more ideas on why that is. Por qué creeis que es una dictadura? por qué son costes altos las comisiones de booking? cuántos de vosotros trabaja con netos “irrisorios” con los TTOO convencionales? cuántos podéis pagar el marketing online que puede pagar booking? por qué es malo que un operado crezca en beneficio de nuestras ventas? por qué es negativo que unos sepan hacerlo bien y otros no? por qué tenéis miedo que os suban las ventas? por qué creeis que si se pierde ese operador ese mismo usuario no acuda a otro? Por qué no se preocupan los hoteles de seguir consejos para poder aumentando las ventas? por qué no estáis en paridad si lo más sensato comercialmente es tener el mismo precio en el mercado sea la web que sea?… hay que empezar respondiendo a estas preguntas y podréis empezar a valorar lo importante que representa que un operador lo haga bien. Yo sinceramente, me siento satisfecha de las ventas que booking y otros online me traen a mi establecimiento. Saludos. Booking.com is by far THE worst offender as far as OTAs bidding on your hotel’s brand name in Google Adwords, many times taking the top spot for the brand of the hotel. The other OTA’s do that occasionally, but Booking.com is the worst. Their “free marketing option” is nothing but a scam to let them steal your branded traffic – which is usually the highest converting traffic you have. Una plataforma tecnologica de la calidad de booking y la visibilidad que da a cualquier hotel aunque sea nuevo, es un privilegio y servivio extraordinario que bien vale ese 15% que creo que cobran..
Los negocios son así. Creo que un hotelero tiene que estar en Booking y en todos ( No queda más remedio ) Estar en todos facilita que las webs, tan de moda en estos momentos ) como trivago.com rastreadordehoteles.com , comparadordehoteles.es, hotellowcost.es, etc, hagan su trabajo, y eso a los usuarios nos facilita la búsqueda. Buscan por nosotros en todas y luego decides en cual reservas. Yo personalmente casi siempre reserbo en Booking. Hace ya mucho tiempo que miro la pagina web de booking, primero era de un tío de Huesca que la vendió a booking, y ahora los tontos de los hoteles que se apuntan para hacer cola y pagar ese 15% incluso del IVA, eso es “regar las malas hierbas”, de toda la vida. Leí ayer el contrato de Booking y ponía que quieren unas supuestas comisiones de 2 meses como fianza (?¿) es completamente macabro. Mi pueblo es un destino turístico importante y no tienen hotel allí, ni lo van a tener, aunque en el google pillen la primera posición no tienen nada. Anna, estoy de acuerdo contigo, cada día salen cientos de webs que te quieren cobrar por anunciarse en ellas, son los nuevos “Esades” ó listos de la clase, los “New Business”. En los seguros de coche igual, ahora la mierdeciella esa de anuncio de acierto punto com que cada día lo vemos a la tele, igual que el trivago, que se reparten la comisión de booking. La gente no es tonta, y les gusta descubrir las cosas por si mismo, no hay que regalar los “negocios a nadie”, si cualquier agencia quiere un 10% ó un 15% que se lo gane, no hay que darle nada y menos en bandeja a nadie. Y eso de dar la tarjeta de crédito a booking ¿? Que se han creido !!! Yo reservo y cuando llego pago y no doy tarjetas ni nada y menos por internet. Como consumidor de booking.com, he comprado en la web de ellos 10 hoteles en estas largas vacaciones y no lo haré más. Me dio mucha rabia eso de aprovecharse de los duenos y operadores de hoteles. Usaré la pagina como base de datos y retiraré mi información. En el caso de Cataluña, además nos vemos obligados a pagar la dichosa Tasa Turística, que supuestamente es para publicitar el turismo en la zona. Opino que con la cantidad de ofertas online existentes es bueno que se filtre y recopile la información hotelera en una gran web de reservas, pero esto debería ser trabajo del Ministerio de Turismo de cada comunidad autónoma con el fin de desarrollar turismo de calidad y ayudar a los hoteleros y comercios. El monopolio de booking.com es innecesario y abusivo.